This week Thread Theory Designs Inc. moved across the city to join us in a new home just begging to be decorated! I’ve compiled a Pinterest gallery of drool-worthy sewing rooms that I hope to glean ideas from for the new office/sewing space. Meg of Made By Meg’s prettily framed sewing samples. 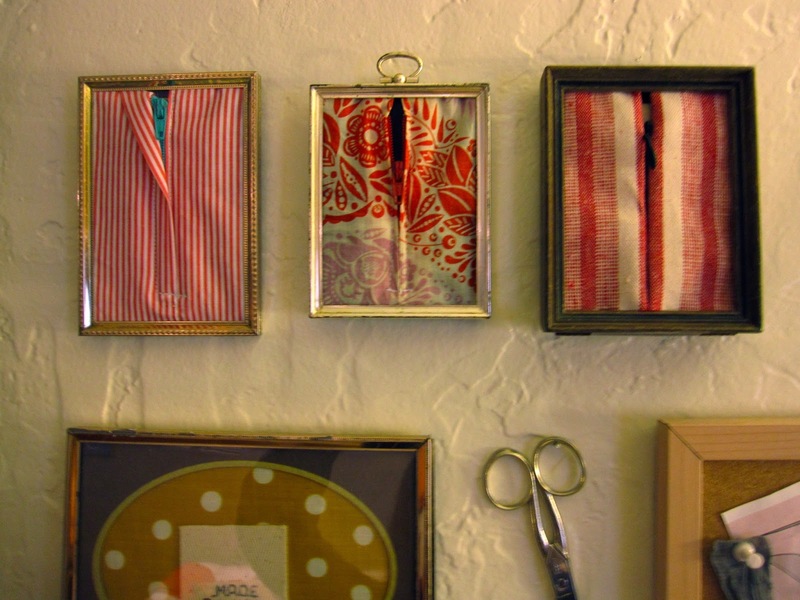 Meg, over at Made By Meg has come up with a great way of displaying sewing samples. I’ve compiled a huge binder of them over the last year of construction classes so am contemplating putting the ones I use most up on my wall in a similar manner. Meg’s space looks so pretty and personalized! Tasia, of the indie pattern company Sewaholic, has made great use of Ikea’s Expedit cabinet. I love how her patterns fit so perfectly in them…I can’t wait until the day when I can have an Expedit of my own filled with prettily packaged Thread Theory patterns! Tasia of Sewaholic’s organized Expedit. Aside from moving and unpacking since last Friday, we have been busy refreshing various websites in eager anticipation of new comments about Thread Theory Designs Inc…we’re both a little giddy with the unexpected and sudden attention our company has received in the sewing world of late! 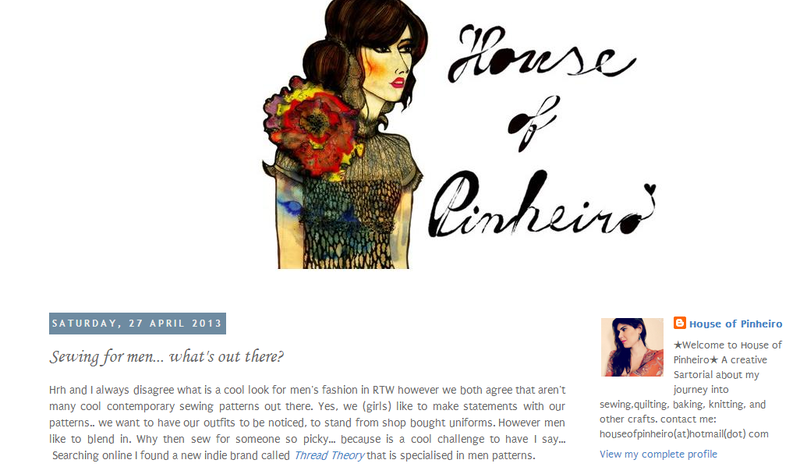 Thank you to House of Pinheiro for featuring us in a blog post last Saturday (April 27th). We were very excited this week by all the views generated for our pattern store stemming from their blog post! 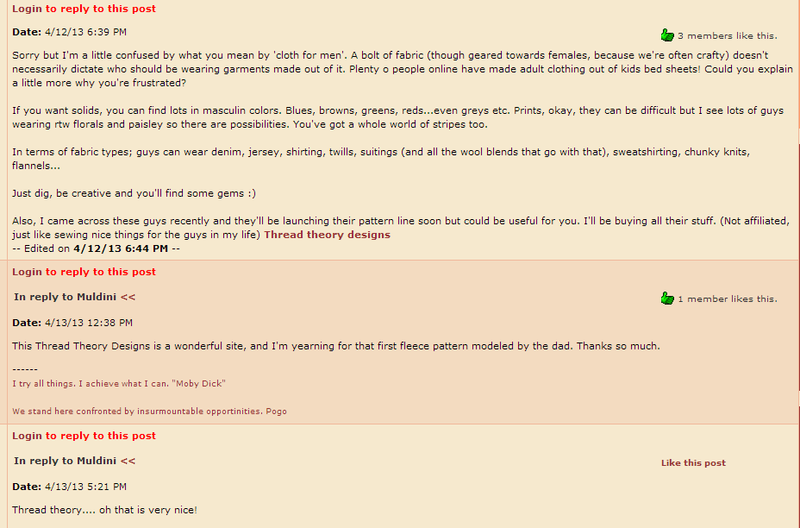 Also, we found Thread Theory mentioned on Pattern Review…we’re so glad that news is spreading like wild fire across the sewing corner of the internet just in time for the Newcastle Cardigan pattern release on May 15th! 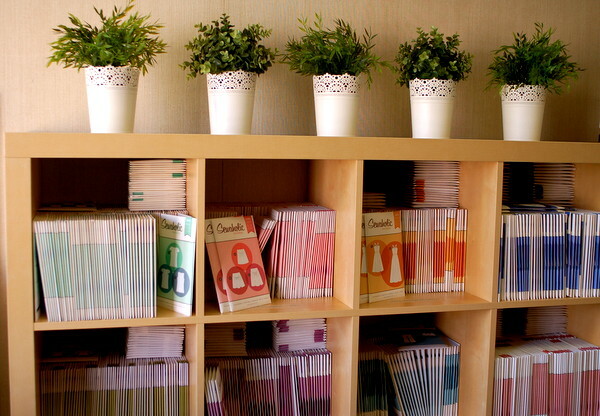 Do you have any sewing room decor or organizing tips to share? I can’t wait to get my room in ship-shape! Categories: Friday Posts | Tags: house of pinheiro, Made By Meg, Sewaholic, sewing room | Permalink. Congratulations on the mentions! Very exciting to see some new indie menswear patterns. I’m so excited for the launch of your first patterns! I enjoy sewing clothes for my boyfriend, but he’s very picky about fit and design so I’ve had to seriously modify existing patterns to get them how he likes them. I know I’ll be making him your Henley shirt first thing. Anyway, good luck decorating your sewing space. Mine’s always a total mess so maybe I can pick up organization tips from you once you’re done. Or I should just learn to pick up scraps, thread and pins as soon as I drop them (…nope). I hope your boyfriend will like the Strathcona Henley! Between work, school and home sewing I’ve developed quite a pin dropping habit too. Maybe having a laminate floor in my new house will result in me doing a quick sweep after each time I sew (maaaaaybe! ).